World Business Reports: At the same time, around 1900, scientists discovered “petrochemicals”. This gave the ability to create all kinds of chemical products from petroleum. For example, the first plastic, called Bakelite, was derived from petroleum in 1907. Scientists have discovered several vitamins and have detected that many substances could be derived from petroleum. The best thing about petrochemicals was that everything could be patented and sold for big profits. But there was a problem with Rockefeller’s plan for the medical industry: natural / herbal medicines were very popular in the United States at that time. Almost half of doctors and medical schools in the United States having been practiced holistic medicine, using knowledge of Europe and Native Americans. Rockefeller, the monopolist, had to find a way to get rid of his biggest competition. Then he used the classic “solution-problem-solution” strategy. That is, it creates a problem and scares people, then offers a solution (pre-planned). (Similar to the fear of terrorism, followed by the “Patriotic Law”). He went to see his friend Andrew Carnegie, another plutocrat who made his money monopolizing the steel industry, who designed a plan. From the prestigious Carnegie Foundation, they sent a man named Abraham Flexner to travel around the country. He reported on the state of medical schools and hospitals in the country. This led to the Flexner Report, which gave rise to modern medicine controlled by Big Pharmamafia as we know it. Needless to say, the report spoke of the need to reorganize and centralize our medical institutions. According to this report, more than half of all medical schools were closed soon by Big Pharma. Homeopathy and natural medicines have been ridiculed and demonized. The doctors were even imprisoned. To help transition and change the minds of other physicians and scientists, Rockefeller has donated more than $ 100 million to universities and hospitals. He has founded a philanthropic front group called the General Education Board (GEB). This is the classic carrot and stick approach. In a very short time, the faculties of medicine have been rationalized and homogenized. All the students were learning the same thing and the medicine was about the use of patented medicines. Scientists have received enormous subsidies to study how plants cure diseases. Their objective was to identify the chemicals in the plant and to recreate in the laboratory a chemical substance similar, but not identical, that could be patented. A pill for a patient became the mantra of modern medicine and Big Pharma earned a huge profits . And you thought the Koch brothers were bad? Then, 100 years later, we are producing doctors who know nothing about the benefits of nutrition or herbs or holistic practices. We have a whole society that is subordinated to companies for their welfare. The United States spends 15% of its GDP on medical care, which should be called “patient care”. Big Pharma cares only about its profits and does not focus on healing, but only on symptoms. This created habitual clients. There is no cure for cancer, diabetes, autism, asthma or even influenza. Why should there be real remedies? It is a system founded by oligarchs and plutocrats, not by doctors. As for cancer, oh yes, the American Cancer Society was founded by Rockefeller in 1913. In the breast cancer awareness month, it is sad to see people brainwashing to receive chemotherapy, radiation and surgery. 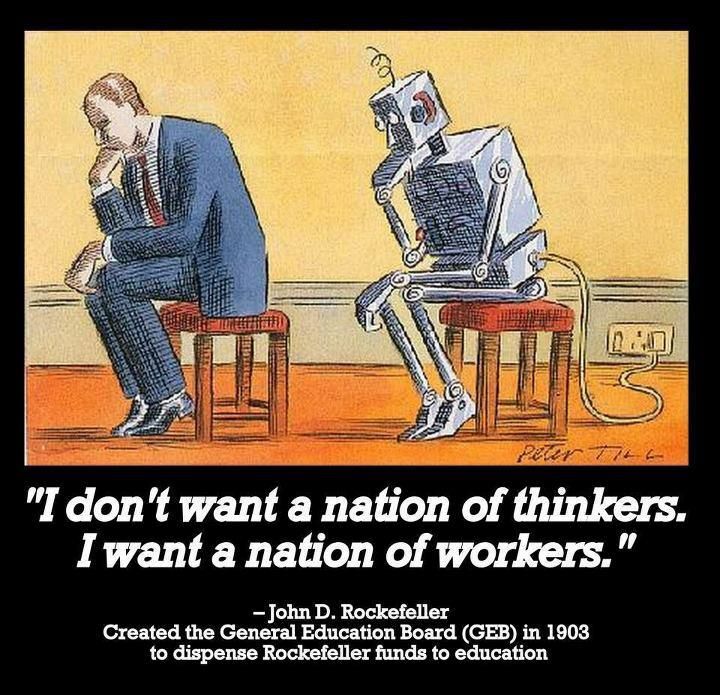 It’s for another blog post … but here’s a quote from John D. Rockefeller that sums up his vision of the New World Order for America. 2 THINGS you forgot – how ROCKEFELLER – GOT RICH so quickly and the many deaths of DOCTORS – HOLISTIC DOCTORS that want to cure – NOT use PIG FARMA BAND-AID SOLUTIONS – BUT ACTUALLY WANT TO HEAL PEOPLE – NOT STEAL OFF the SICK and PROFIT from WARS and DISEASES etc. This entry was posted in * COURT CASE INFO, * End GAME - GOOD vs EVIL, * FREEDOM FIGHTERS, * INFORMATION SOURCES, * MILITARY FORCE UNITS, - CRIMES Against Humanity, - HIDDEN ♠ CONTROLLERS, - INSANE DICTATOR MOVES, - SECRET EVIL SOCIETIES, - WARS - ON HUMANITY, AGENDA 21 ♠ EUGENICS, ♠ NEW WORLD ORDER ♠, BAD BANKSTER ♠ CRIMES, Bankster Mortgage Fraud, CENTRAL Banks Fed R, DEATHS OF HUMANS, EDUCATIONAL CRIMES, Environmental Disasters, Fake & Rigged [s]ELECTIONS, GEO-ENGINEERING, HEALTH CARE CRIMES, Hidden Evil Invader Species, HUMAN ORGAN SALES, HUMAN SACRIFICES, HUMANS in SLAVERY, ILLUMINATI DECEPTIONS, MILITARY RESOURCES, MIND-CONTROL HUMAN, PHARMACEUTICAL FRAUD, POLITICAL - PUPPETS, POSITIVE vs NEGATIVE, PSYCHIATRY - FRAUDS, RELIGION - MURDERS, ROCKEFELLER BANKSTERS, ROTHSCHILD BANKSTERS, TAXES & TAX FRAUD, UNJUST FRAUD CRIMES, UNJUST THEFT CRIMES, URGENT MESSAGES, WAR SOLDIER MURDERS, WARRANTS FOR ARREST, WARS EVIL COMPANIES, WARS ON DISEASES, WHAT IS HAPPENING ?, What's Up - Dark Cabal, WORLD ♠ GANGSTERS. Bookmark the permalink.